A couple of months ago, Yotaan wrote an article about whether or not he was going to participate in the WoD beta. Originally I had agreed with all the points he made, and was not going to try the beta. Then the beta was actually released. And I’m having second thoughts. On one hand, I want to avoid spoilers for story from WoD as much as possible. I have this bad habit of reading the ends of books before I get to them just to read all the twists, and I don’t want to know the plot twists of WoD. I try not to look at the new lore, new characters, or new zones too much as well, because I want the experience to be brand new when the game launches. If I were to join the beta, it would be like me flipping to the back of the book but not reading the plot twists, just the other narrative stuff. It would be very very hard not to spoil parts of the story for myself. However, on the other hand I have been eagerly reading up on all the quality of life and mechanic changes. Things such as the change to banks, reagent stacking, and especially character models interest me incredibly. So lets say for a second that I’ve gotten into the beta. My plan would be to test out the new models, and check out how said models have been implemented around Azeroth (not Draenor). I would test the class changes and provide feedback. I would write about the changes I experience in this blog. But the one thing I wouldn’t do, is actually go to Draenor. Is that a good use of beta privileges? Would that be a waste of testing? And most importantly, would I be spoiling WoD for myself? This is my current conundrum, and so I turn to you, the readers. What should I do? Opt into beta and play it, or let someone else use that pass? Addendum: As you can see, we are back! We should be updating the blog regularly now, so about 1-2 posts a week. Also, you may notice some slight changes in the appearance of the blog. What do you all think? Alright, raise your hand if you have joined into that LFG group where everyone is reminiscing about the ‘good ole days’ of WoW. Raise your hand if you have started such conversations yourself before. The runs where things such as vanilla shaman, talent trees, and BC raiding are spoken about with reverence. This, my good friends, is called nostalgia. With the approaching of the Warlords expansion, it seems nostalgia has become more prevalent. Perhaps this is because WoD is made with the intent to remind players of the days of Burning Crusade. Or perhaps this is because players are bored with nothing better to do. Either way, we at Growing up in Azeroth have seen an increase in nostalgic conversations in the WoW community. Fussypants – I’ve been running a ton of instances of both PvE and PvP at many different levels. I’ve been reading a variety of WoW related sites on the Internet. And I have been talking with a bunch of other WoW players. Throughout all of this interaction, I have witnessed a ton of nostalgia in the Warcraft community. Most of the times, it’s just a simple little ‘remember how this was in Wrath?’ but sometimes it’s an active ripping on the game as it currently is. By all accounts, I should be one of the more nostalgic players out there. 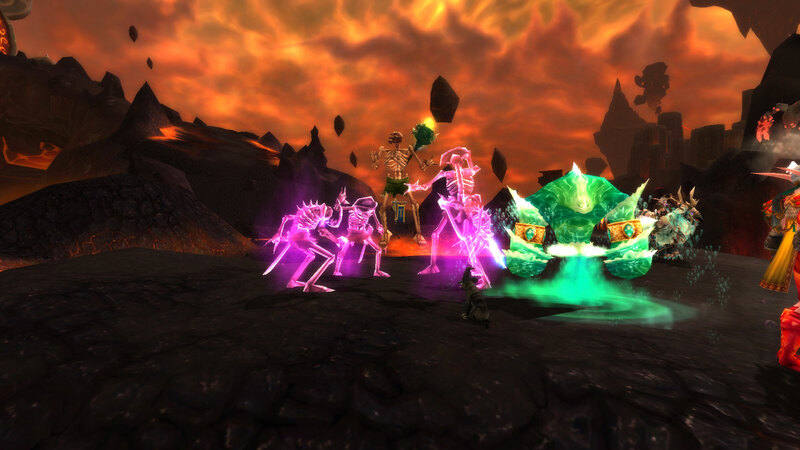 I started WoW in BC, the so-called ‘golden age’ of WoW. I’ve played through all the changes and iterations of the game. I grew up in this game, for heaven’s sake! But I’m really, really not nostalgic. The explanation I have in my head for this is I was pretty little when I started playing (all things being relative). I frankly don’t remember much of what the game was like in BC and Wrath. But what I do remember wasn’t all that amazing. I remember having to constantly buy arrows for my hunter. I remember having engineering, and crafting over 200 bullets only to have to destroy them because I couldn’t sell or use them. I remember melee as a hunter because I didn’t have the food to feed my pet and I was broke so I couldn’t buy arrows. I remember the first time I got 1g, which was around level fifteen. I remember spending hours to try to find where I needed to go for one quest. The ‘golden old days’ weren’t all that golden. For a noob such as me, they were downright painful. Some of my favorite parts of the game from that time, fishing (I was little, ok?? ), creating and naming a character, and actually exploring the world haven’t changed at all. But the parts that made the game frustrating have been streamlined or removed completely. The game in infinitely better than it was back then. The thing people really miss is being a noob to the game. When even common things seemed cool, and when the entire world was new and unexplored. But what’s ridiculous about that, is that when the game is changed making it new all over again, the players freak out. ‘These changes are ruining the game! I miss how it was before!’ No, no you don’t. Because you complained about those things when they were reality. No one still wants to wait till level 40 and a crud-ton of gold for a basic mount. No one wants to spam trade chat for hours, trying to get a group together to run dungeons. It was only fun then because it was new. And once it wasn’t new, it got annoying and tedious. So it was changed, but the players wanted it back. In my mind, nostalgia is a wicked catch 22. Players want to be a noob again, but when their game is changed (thus making parts of it new again), they want it back the original way. Never mind that the changes could make them a noob again for a short while. You can’t want the game to be entirely new all the time without changing it. It’s impossible! Maybe I’m missing the point. Maybe, because I can’t remember much of my early years of WoW playing, I’m not getting this whole nostalgia thing. Feel free to tell me if this is the case. But I truly believe that the game is better now than it has ever been before, and that ultimately the game needs to continue radically changing. Yotaan – I find it hard to argue with Fussypants. Unlike her, I do have lots of good memories of earlier expansions. It was tough to get groups together and you were limited to one spec back in BC. I really remember an instance in Tanaris that was a lot of fun. It was one of the troll ones that was outdoors. After looking in chat for a healer and a tank without success and ending up with 5 DPS,we decided to go for it. So I healed as elemental and a enhancement shaman tanked! The run great even though we didn’t even finish. I don’t even think anyone got any decent loot. But good memories are not nostalgic, they are just fond remembrances. Just because that was a great run does not mean that we should go back to those times. They were not “better days.” In fact, I can tell you more stories of not having fun and frustrating gaming. We must remember that change is inevitable, and only the foolish want things to stay the same. I say enjoy your memories of fun times, embrace the now, and expect it to be all different down the road.